The Indian consumer likes to stay abreast with the latest technology and devices. With multiple launches happening across categories such as phones, tablets, automobiles etc. every month, an average consumer is spoilt for choice. The purchase is not limited to just shops anymore; online market in India is also growing at exponential rate. However, what happens to the stuff that is getting old? It is either handed down among relatives or just stuffed at a corner in the house accumulating dust, more often the latter. An alternate solution is to just sell it online. 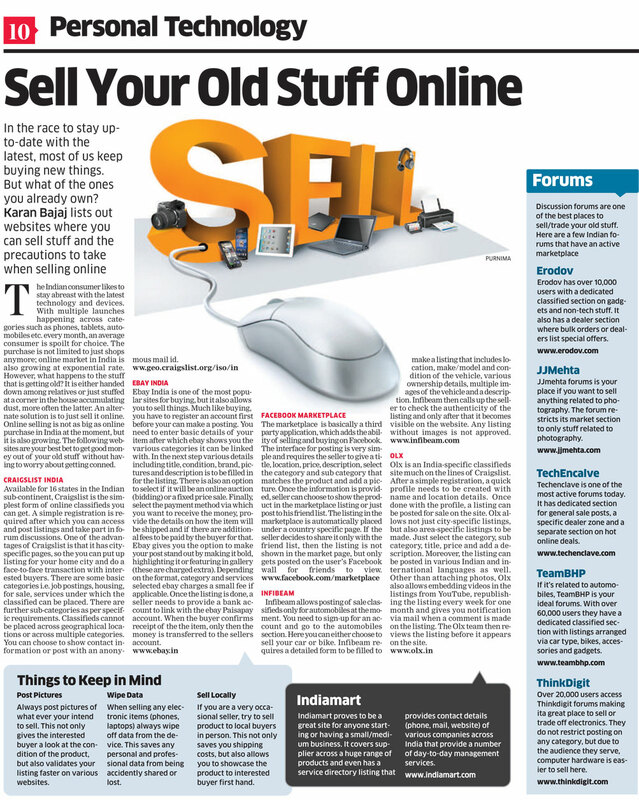 Online selling is not as big as online purchase in India at the moment, but it is also growing. The following websites are your best bet to get good money out of your old stuff without having to worry about getting conned. Available for 16 states in the Indian sub-continent, Craigslist is the simplest form of online classifieds you can get. A simple registration is required after which you can access and post listings and take part in forum discussions. One of the advantages of Craigslist is that it has cityspecific pages, so the you can put up listing for your home city and do a face-to-face transaction with interested buyers. Ebay India is one of the most popular sites for buying, but it also allows you to sell things. Much like buying, you have to register an account first before your can make a posting. You need to enter basic details of your item after which ebay shows you the various categories it can be linked with. In the next step various details including title, condition, brand, pictures and description is to be filled in for the listing. There is also an option to select if it will be an online auction (bidding) or a fixed price sale. Finally, select the payment method via which you want to receive the money, provide the details on how the item will be shipped and if there are additional fees to be paid by the buyer for that. Ebay gives you the option to make your post stand out by making it bold, highlighting it or featuring in gallery (these are charged extra). Depending on the format, category and services selected ebay charges a small fee if applicable. Once the listing is done, a seller needs to provide a bank account to link with the ebay Paisapay account. When the buyer confirms receipt of the item, only then the money is transferred to the sellers account. The marketplace is basically a third party application, which adds the ability of selling and buying on Facebook. The interface for posting is very simple and requires the seller to give a title, location, price, description, select the category and sub category that matches the product and add a picture. Once the information is provided, seller can choose to show the product in the marketplace listing or just post to his friend list. The listing in the marketplace is automatically placed under a country specific page. If the seller decides to share it only with the friend list, then the listing is not shown in the market page, but only gets posted on the user’s Facebook wall for friends. Infibeam allows posting of sale classifieds only for automobiles at the moment. You need to sign-up for an account and go to the automobiles section. Here you can either choose to sell your car or bike. Infibeam requires a detailed form to be filled to make a listing that includes location, make/model and condition of the vehicle, various ownership details, multiple images of the vehicle and a description. Infibeam then calls up the seller to check the authenticity of the listing and only after that it becomes visible on the website. Any listing without images is not approved. Olx is an India-specific classifieds site much on the lines of Craigslist. After a simple registration, a quick profile needs to be created with name and location details. Once done with the profile, a listing can be posted for sale on the site. Olx allows not just city-specific listings, but also area-specific listings to be made. Just select the category, sub category, title, price and add a description. Moreover, the listing can be posted in various Indian and international languages as well. Other than attaching photos, Olx also allows embedding videos in the listings from YouTube, republishing the listing every week for one month and gives you notification via mail when a comment is made on the listing. The Olx team then reviews the listing before it appears on the site. Indiamart proves to be a great site for anyone starting or having a small/medium business. It covers supplier across a huge range of products and even has a service directory listing that provides contact details (phone, mail, website) of various companies across India that provide a number of day-to-day management services. Post Pictures: Always post pictures of what ever your intend to sell. This not only gives the interested buyer a look at the condition of the product, but also validates your listing faster on various websites.